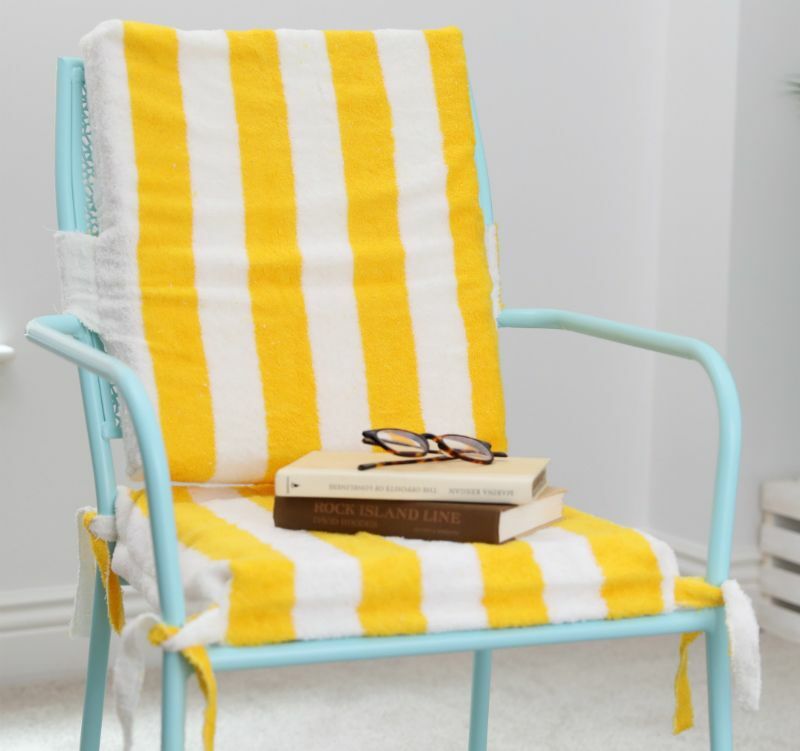 You can instantly turn any chair into a poolside lounger with this easy upcycled bath towel craft. If you have a pool, then it's the perfect touch. The towel absorbs water, so it's functional. Plus, if you use a cute beach towel then you'll really get the vibe you want. If you don't have a pool, you can still use this project to create a summer vibe for any outdoor space. You'll make both a seat cushion and a back cushion for this project. For the most part, the two cushion covers will be the same, but slight differences exist that you'll want to pay attention to. The back cushion has an extra fabric strip that becomes the strap that secures it to the chair. In contrast, the seat cushion stays in place thanks to ties in each corner. Those subtle differences give the finished project a polished look. 1. Measure the length and width of both the seat and the back of the chair. 2. Place a transparent measuring grid atop the foam. Measure out the dimensions you calculated in the first step for both cushions. 3. Mark those measurements on the foam with a black marker. 4. Cut along the marker lines. You should have two pieces of foam, one for each cushion. 5. Measure all the way around the foam for each cushion, including the depth of the sides. 6. For each cushion, take the measurement that you calculated in Step 5 and double it. Add 2 inches of overlap plus a little bit more for ease and seam allowance. Once you have that number, measure the towel's lengths to those dimensions. 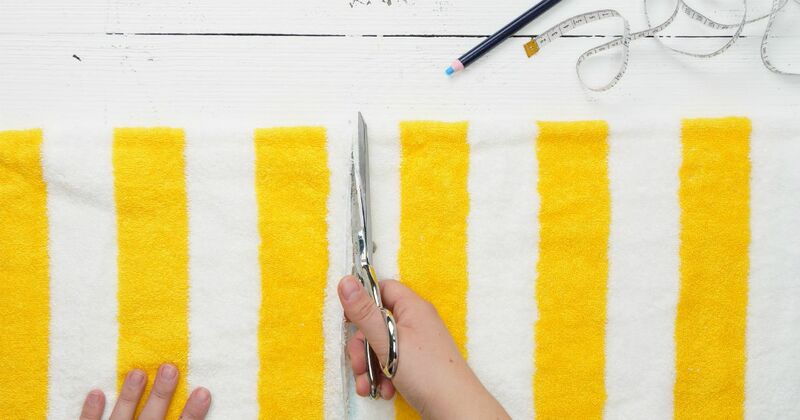 Mark the measurement with a fabric pencil and cut out the fabric for each cushion. 7. Measure the fabric widthwise using the following calculation: width of foam plus half the depth of the foam plus a little bit extra for ease and seam allowance. Mark the measurement with a fabric pencil and cut out the fabric for each cushion. 8. Lay each piece of fabric flat with the long side horizontal, parallel to you. Fold the left and right sides in toward each other so you're folding the entire thing in thirds. Overlap the two sides by approximately 2 inches. 9. Place straight pins evenly across the top and bottom edges of the fabric. Do this for each cushion. 10. Measure out a strip of the fabric width that's 2 inches wider than the width of the chair back. Mark the measurements with a fabric pencil and cut the fabric. 12. Stitch the sides together for both cushions, and cut off any excess thread. 13. Pull each of the corners of the back cushion apart. Pin them approximately 1 inch from the edge. Stitch where you have pinned. 14. Trim the seamed corners with scissors. 15. Turn the towel inside out and place the foam cushion inside. The back cushion is now complete. 16. Using remaining fabric, cut out same-size strips of fabric to use as chair ties for the seat cushion. Each strip should be about 1/2 inch wide and 6 inches long, but you can adjust that to your preference. 17. Pull apart the corners of the seat cushion cover. Pin two strips to each corner, approximately 1 inch from the edge. 18. Stitch the corners you've pinned, attaching the strips to the corners. Snip off any excess thread. Trim the seamed corners with scissors. 19. Slip the completed back cushion over the chair, where it will be held in place by the fabric strip. 20. Place the completed seat cushion on the chair. Tie each set of the corner strips together around the arms of the chair.